As my tests continued, I felt the need to step up to processing longer lengths of film. Over the last few months, I've been thinking about how to achieve this; to get cleaner results and be able to process lengths of up to 50 feet of film at a time. One can go on to a popular auction site and find old second hand 'Lomo tanks', but these seem to cost around £150 for the 50 foot version ... a lot to pay for a piece of soviet-era bakelite that might well turn out to be incomplete or broken on arrival. 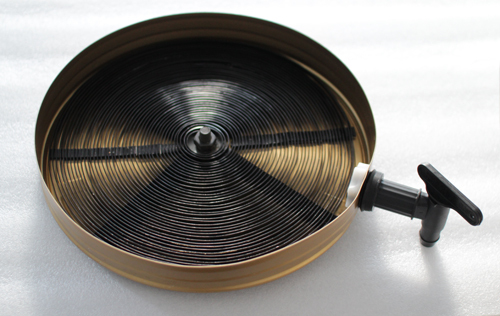 The most complex part of this project was creating a spiral to hold 50 foot lengths of the cine film. 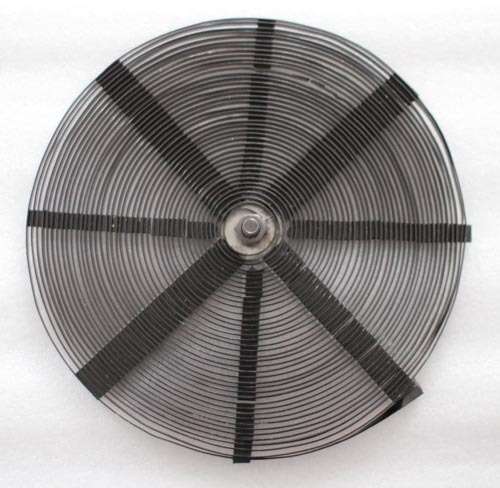 I found that 5mm x 1mm flat aluminium craft wire could be bent into the right shape with the aid of foam strip 'formers' to temporarily fill the gaps between the wire loops. The spiral fits neatly inside my chosen processing tank. The tank is a re-purposed old 35mm film can. 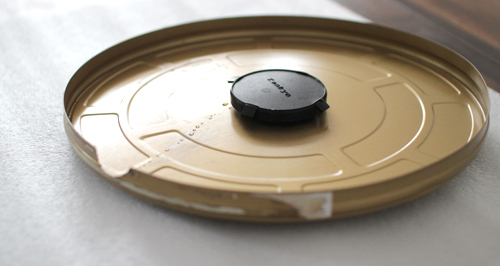 On the underside of the lid, there's a 'low profile' aquarium strainer with an old lens cap glued on to it. This arrangement enables liquids to be poured in without light leaking in too. I made my first use of the tank last night, processing about 37 feet of B&W negative film using the same Caffenol C-M developer recipe as before. This is the remaining film of the cartridge I'd been developing for my previous tests, so a good length, but not a full roll. There was space for more film though, so if my measurements are correct, the spiral should be able to take a full 50 foot load. LOADING: Getting the film on to the spiral has to be done in darkness (my loft) and was a little fiddly at first. 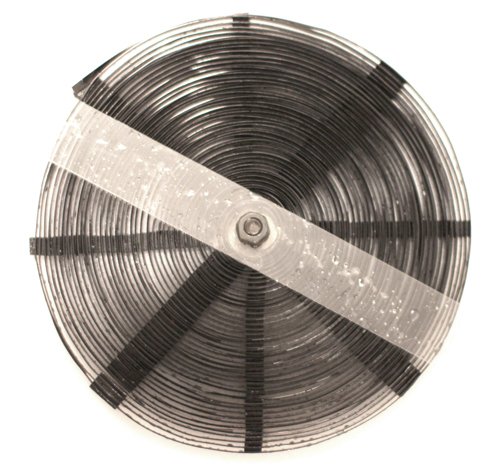 After about 20 minutes I'd done it; evolving a technique of feeding the film from the cartridge, rotating the spiral gradually and pressing down on the spiral to keep the film in place during the loading process. All I'd read about loading the real Lomo spiral helped; the film is perfs down, and emulsion out, and holding the cartridge at a 45 degree angle seemed to help too. 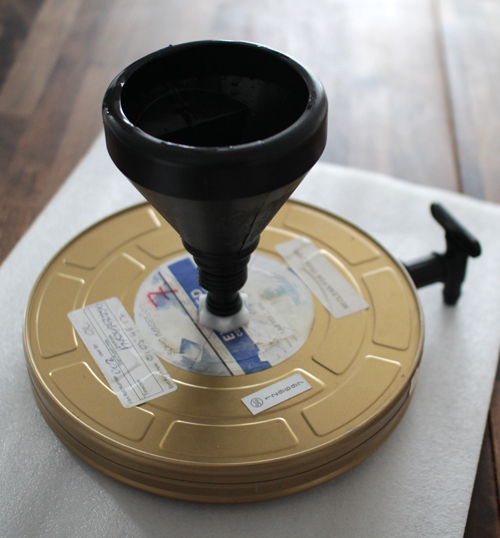 Once the film was on the spiral, I put the spiral in the can and taped up the sides of the can with black tape to keep it light-tight. The rest of the processing took place in my kitchen, under subdued lighting, but not total darkness. 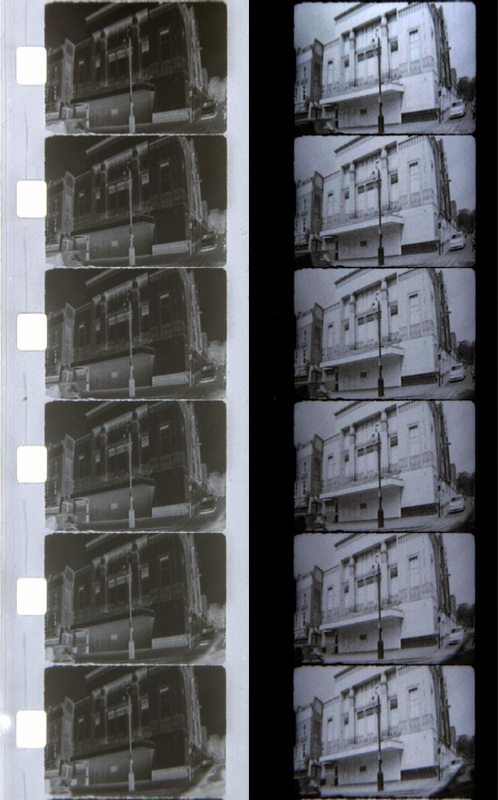 PROCESSING: The tank requires 1 litre of developer to adequately immerse the 8mm film. Pouring in the developer solution was pretty fast, I could get a litre of the stinky brown liquid into the tank in around 15 secs. There's no device for agitating the tank here, so I just gently rocked the tank to move the developer about during the first minute then a little bit more every minute thereafter for the 15 minute developing time. Drainage of the tank using the keg tap is slow. I found that I needed to gently incline the tank whilst draining, but not too much, because the sides of the film can are definitely not water tight. Drainage took about a minute. I followed the developing stage with a water stop bath, then standard Hypo fixer. I kept the film on the spiral for washing and drying too. SUMMARY: The developing tank works! There are pictures on the film, but until I can digitize the film it'll be hard to assess the quality of this arrangement. 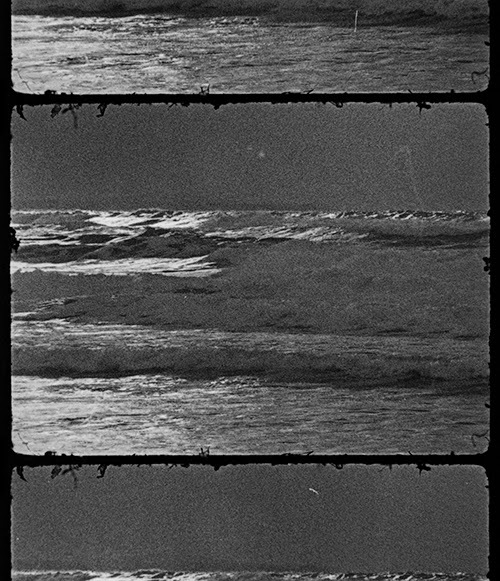 The real test will be to see if the developing is even and whether the spiral has introduced any marks along the film. So at the moment, it's a qualified success. The design could benefit from a faster drainage system and perhaps the spiral could use some kind of top-piece to hold the film down into the grooves (The real Lomo tank has a top plate for this). 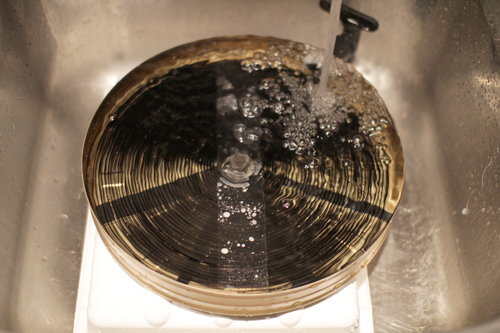 However, the film did stay in place throughout the developing and only started floating off the spiral during some over-zealous tap jetting during the final wash process. The edges of the can are not watertight, but if the tank is kept level during processing and only gently and gradually tipped during drainage, this doesn't seem to be a problem. Tonight I've just put a whole 50foot cartridge worth of film into the tank for processing in Caffenol C-M again, (same recipe as before). I've had a NIGHTMARE loading the tank the second time... 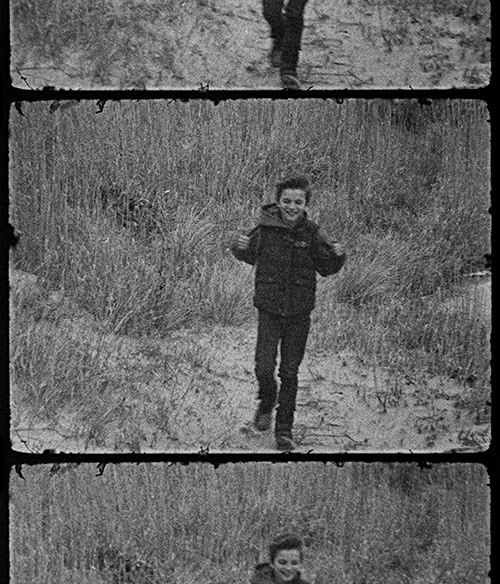 It all went wrong when I somehow let the end of the super 8 film disappear back inside the cartridge... This meant that I needed to take tools into the dark to try and hack open the cartridge, then I had a roll of film snagging and not dispensing easily... I must have had beginner's luck the first time I loaded the spiral (about 20 mins) because this time I was in the dark for well over an hour. They say you learn by your mistakes, what a lesson! I put this note here in the hope that others might learn this the easy way. However, once loaded the processing went well. The new top bar kept the film in place this time, so I could be a little more vigorous with the washing and drying of the film. 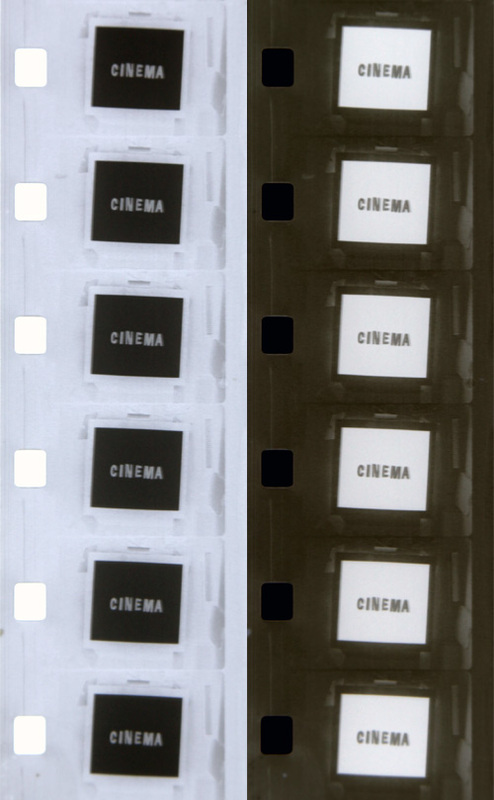 I put the film strip on a lightbox and took a few photos. 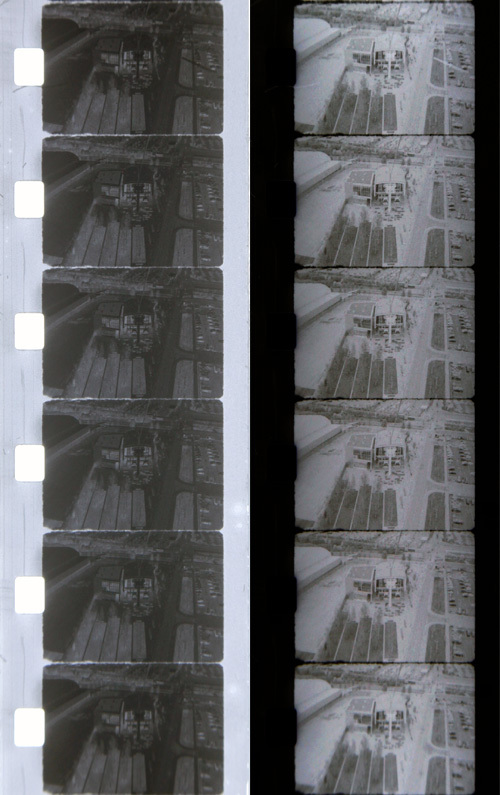 The left side of each image shows the film negative as processed (with a few Levels tweaks), the right hand image shows the image digitally inverted back to positive. 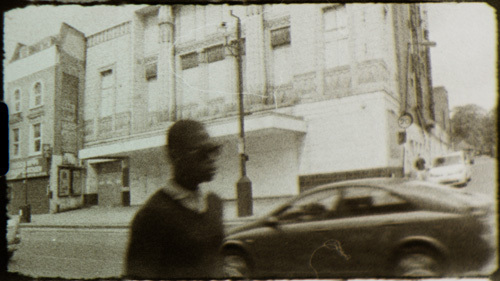 These images will look slightly squeezed, due to an anamorphic lens being used during filming. The first part of the film was some titles and text animation tests. 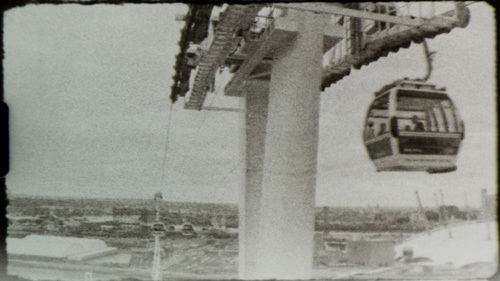 View from the cable car of post-industrial sprawl. 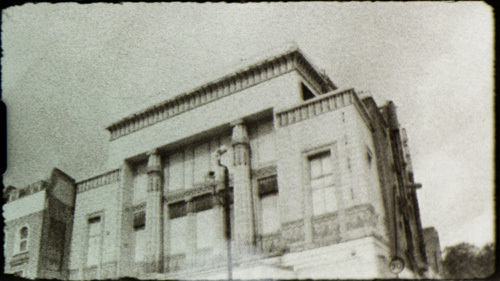 The wonderful 'Egyptian' façade of the old Carlton Cinema in Islington. I'm actually quite encouraged by the results, there's certainly a usable image there, I was expecting more blotchy and irregular results than this. I also took a few stills of individual frames. 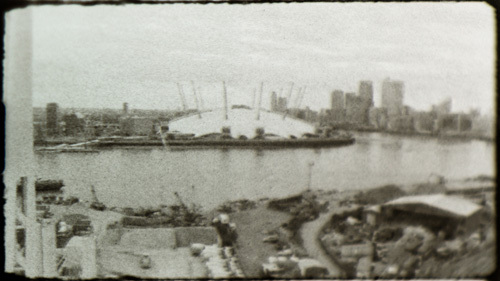 This is extreme macro photography, the images on the film are only about 5mm wide. 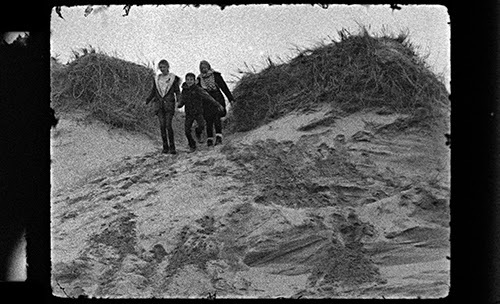 For these stills, I stretched the images back to the correct 16x9 aspect ratio to 'undo' the effect of the anamorphic lens adaptor. 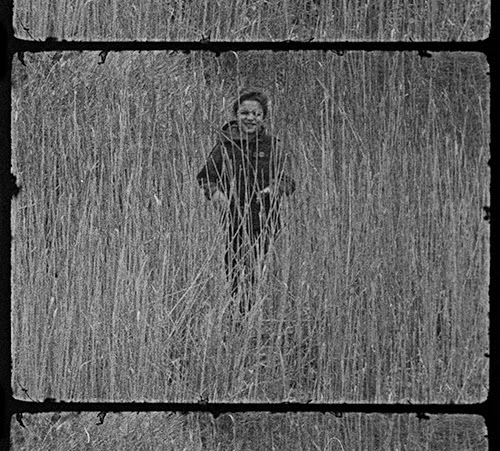 Here's a little experimental film. 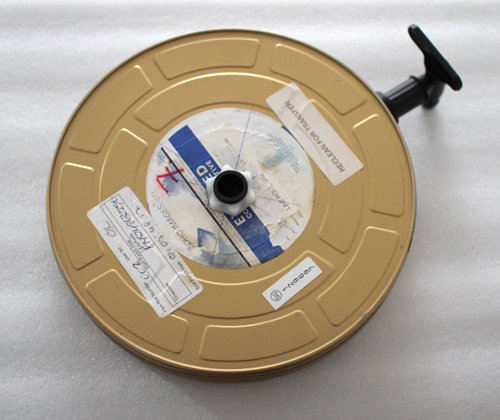 Super 8 cine footage of the Ken Fox Wall of Death Troupe doing their death-defying thing in Enfield in May 2013. I shot black and white negative film because I wanted to try some home processing. 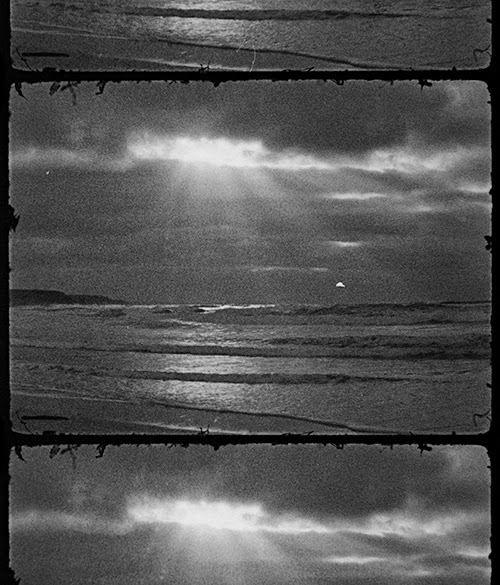 This film was developed in short lengths using Caffenol C-M developer. 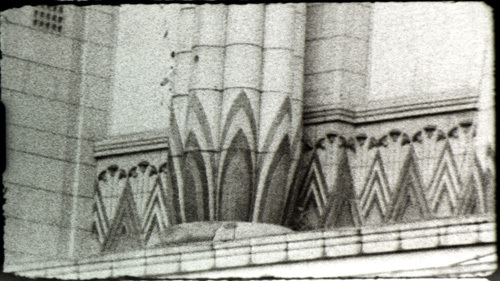 The film was digitized in various ways, partly with a flatbed scanner, but mostly using a DSLR camera and macro optics to re-photograph the tiny frames. 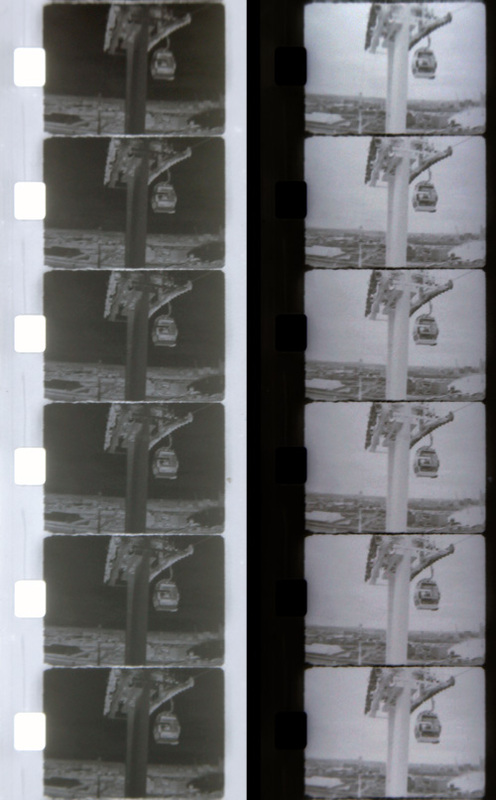 Some of the film was advanced by hand under the camera, and some strips were moved using a stepper motor/sprocket wheel mechanism I've been working on. Here's a new video I've just shot/edited for Simon's Cat Ltd. Here, Simon Tofield is seen bringing his unique illustration talents to bear on a gigantic fibreglass Gromit sculpture in aid of the 'Gromit Unleashed' campaign.